The popularity and credibility of CNN is again being abused by malware authors. We have received reports of spammed messages that purport to come from the popular news network. 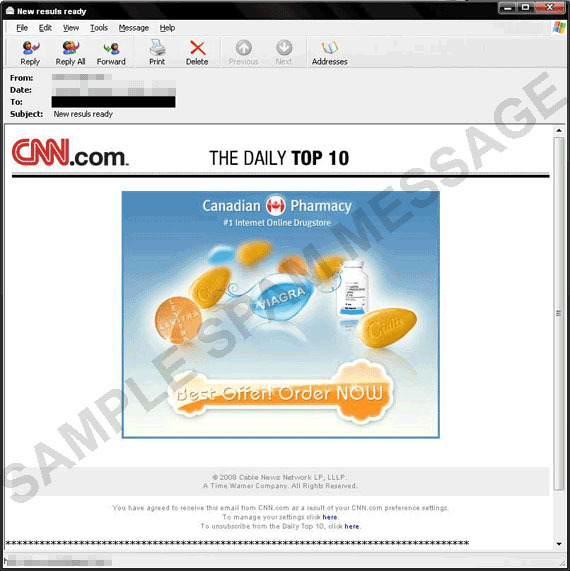 But this time, instead of fake news, the mail contains a clickable image that redirects users to an Online Canadian Pharmacy that offers different sexual enhancement drugs such as Viagra, Cialis, Phentrimine, Soma, VPXL, Levitra, etc. 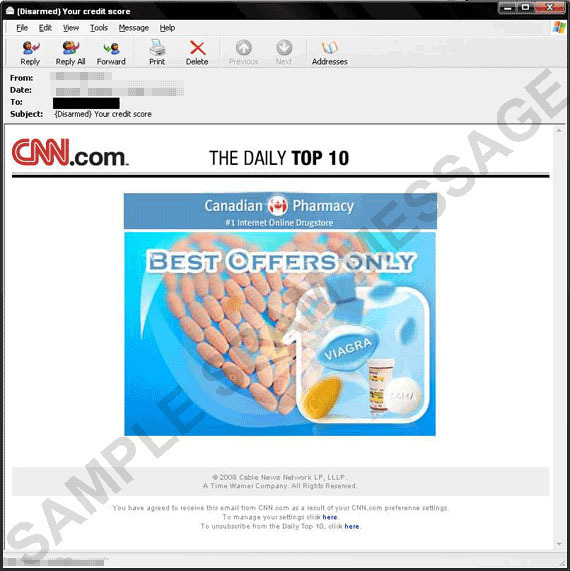 Also, this scenario of sexual enhancement drugs-related spam following malware-related spam runs denotes a “testing technique” spammers are using. It is possible that the malware-related spam runs are used to, first, test the viability of the propagation, and second, to turn infected machines into spam bots that will churn out spam for the next runs. This technique was previously seen used on ImageShack-hosted SWF files, where a malware-related spam run was first seen, and followed by another spam run using the same technique, but this time endorsing sexual enhancement drugs. This spam is already blocked by the Trend Micro Smart Protection Network. Other users are advised to ignore similar messages that arrive in their inboxes. Using this same social engineering technique, spammers are also using CBS in the email messages they are mass mailing. These fake CBS messages share a very similar characteristic with those from the CNN run: instead of links, spammers embedded clickable images in the message body. When clicked, these images lead users to the same Canadian Pharmacy website.